MyMemories Blog: Meet feature Designer Albums To Remember! Meet feature Designer Albums To Remember! Designing scrapbook kits has been a part of my life since 2009. I am a wife, mom, sister, and aunt. I have two kids aged 16 and 14 so life is busy. I enjoy traveling, family, friends and my church. I love seeing what you create with my kits and templates so please feel free to share your creations on my Facebook page or in the My Memories Suite forum. 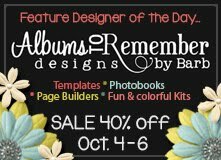 Visit Albums to Remember in the Design Shop & enjoy 40% off!